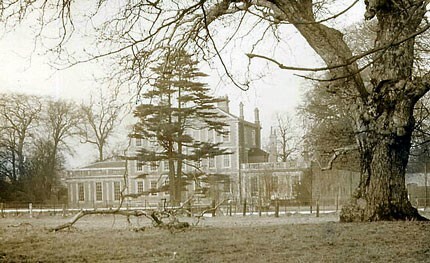 Middlethorpe Hall taken from the garden by B. C. R. Dodsworth. In 1850, Middlethorpe Hall, which was built for the Barlow family, was about 150 years old. Frances Barlow was the last member of the family line. She was now a widow and had moved to one of her Dringhouses properties where she could supervise the building of St Edward the Confessor’s Church in memory of her late husband, the Reverend Edward Leigh. In 1851 she married again. Her second husband was Matthew Wilkinson who had a medical practice in Manchester. Middlethorpe Hall was once again let to tenants and for the next 30 years it became a girls’ boarding school. Lucy and Eleanor Walker took the tenancy and opened the school. They paid a rent of £72.16s. 3d (about £72. 80p) for a half-year. This rent was payable on Lady Day (March 25th) and Michaelmas (September 29th) each year. On the 1851 census 21 girls listed as pupils were living there. They were aged from 9 to 18. Their places of birth were other parts of Yorkshire, northern England and Scotland. Six servants also lived at the Hall. On the 1861 census, the school had expanded and now had 37 girls, one of whom was born in Algeria and another in France. Anna Johnson was now in charge of the school and there were three other teachers including Mademoiselle Laurancy who taught French. Six live-in servants and a stable boy were also there. The census gives us very little information about the backgrounds of the girls who came to the school and their life there. Many questions are left unanswered. What subjects did they learn? French certainly seems one of them. Where were the schoolrooms, where did the children have their meals and where did they sleep? What did they do in the evenings when the shutters were closed and there was just candlelight or the light from oil lamps? Did they play games, read stories, write letters home, darn their stockings or roll their hair in rags to curl it? In the 1870’s the numbers of children at the school decreased to 25. Anna Johnson now had four teachers to pay and there were seven servants. The rent had increased to £88. 2s. 6d (about £88. 12p) per half year. Perhaps rising costs and fewer pupils was the reason why the school closed, for in 1881 the census shows that members of the Wilkinson family, who owned the Hall, were living there. On the census for Middlethorpe Hall for 1861 there was the following entry: Eliza Leckonby, aged 16, a kitchen maid, born in Bubwith. She was my great grandmother and I know that she could barely read and write. I wonder what she thought of the young ladies whose teenage years must have been so very different from her own? I am so pleased to see this article about Middlethorpe Hall as a school – I’ve been trying and failing to find out about exactly when it was used in this way, and who ran it. My interest is because of my research for my book on the life of Florence Nightingale Shore, a god-daughter of Florence Nightingale who was a decorated army nurse, and later murdered on a train in 1920. FNS was distantly related to the Wilkinsons, and was at Middlethorpe Hall in 1881, according to the census – and possibly earlier, as she did go to ‘high school’ in York. Another famous nurse, Ethel Bedford Fenwick, was also a pupil at the school a little earlier.